Mike Moore | The Journal Gazette: Paul E. Ripley, a Fort Wayne veteran of World War II, is awarded the French Legion of Honor by Consul General of France Guillaume Lacroix during a ceremony at the Cathedral of the Immaculate Conception on Friday. The audience of family and friends gave him a standing ovation, veterans gave him a military salute, and then the Honorable Guillaume Lacroix gave him a medal. The Maltese star hanging from a red silk ribbon presented Friday to 95-year old Fort Wayne veteran Paul E. Ripley was truly special -- the Legion of Honor, France's highest distinction for military and civilian service. The award was presented for Ripley's service in World War II, when Ripley was a part of the 9th Army that served under Gen. George Patton during the Brest campaign. The struggle freed the region in the far northwest of France, which held a straggling pocket of German Nazis. 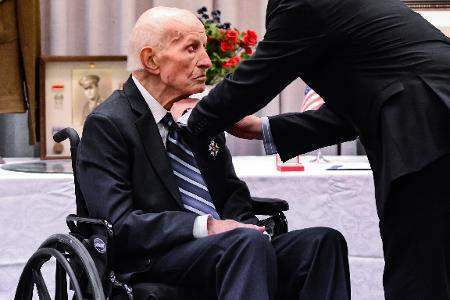 "This is one of those occasions when you hardly know what to say, except 'Thank you,'" he said, speaking slowly from a wheelchair and playing down his work keeping records of the war's casualties as the 9th Army's quartermaster. "The real heroes...didn't come back. Those of us who are here need to honor them every day for what they did and what they enabled us to do," he said. Lacroix, France's general consul for the Midwest, pinned the medal to Ripley's lapel. He said the ceremony is part of a concerted effort by France to honor the remaining few who aided France's liberation during World War II.